Let's go ahead and take a look at a couple of examples. First of all, I want to go ahead and show you a custom, one I put together, just to identify the core techniques that you'd need to use in order to employ Behaviors. So, what I've done is included this content in a Module called glue; which I use for just Hodge-Podge stuff in my Drupal Install that doesn't quite fit inside of another Module. Let's take a look at this line by line real quick. This first line here uses a jQuery object which we can identify with this little dollar sign; and it's attaching it to the, and wrapping around the, entire document. It's saying that when a document is ready, go ahead and run anything inside of this Function. And then, when it's clicked this is what it does: it attaches some content after it using the jQuery after Function. So, let's take a look at what that looks like real quick. On my Drupal Install, what I've done is created a block on the side that just has a Div in it with the glue slash dialog Class that we just looked at in the Code. So, when this is clicked it should add that content after it. Indeed, it works; so I can keep clicking this and keep adding the new content. But, say I want to attach some Behavior to this content here that gets added dynamically. Lucky for us, there's a structure in Drupal called Behaviors that we can use to then attach some Behavior to this content really easily. So, let's take a look at the Code again; what I'm going to do is go ahead and comment out this problematic way of doing things. 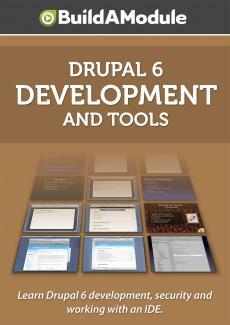 We're going to look at the way that works with Drupal Behaviors. First of all, what we're going to do is define a Function inside of the Drupal dot Behaviors Object and we're going to name it according to our Module name; in this case, it's Glue, and we'll start with a capital letter. If you wanted to, what you could do is just copy of Drupal Behavior's Function from another Module, and we'll take a look at a couple of Modules that implement this, in a bit. Just replace the name out with the Name of your Module with a capital.